Despite my best efforts with my blog – posts about politics, art and travel – it is the cigarette advertising that brings in my readers and sparks interest. It seems, in particular, that Germans are the most curious about my posts, even though all of the examples are free to be seen in any German city. Then there is “Passt Perkfekt ins Jetzt” (right) sort-of Perfect Fit now? And this “compact” innovation. That is interesting. 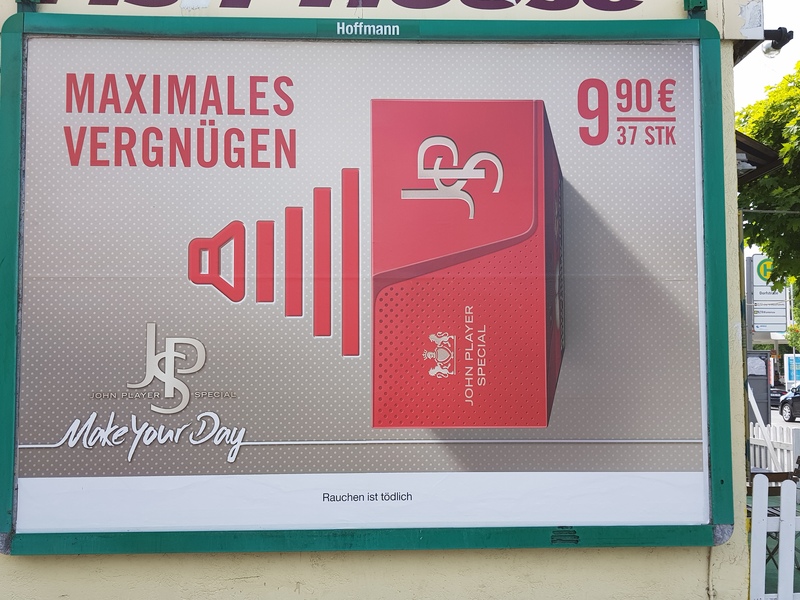 Does that just mean it is narrower because it seems to be cheaper than “Maximales Vergnügen”? There is, however, a new kid on the block, as it were (left). The no batteries needed, of course, refers to the considerable competitive challenge coming from e-cigarettes. And whilst I do not like the latter – users fail to appreciate that the vapour that they produce smells and has emanated from their mouths. It is also voluminous (I am sure this is deliberate on the part of the manufacturers and is unnecessary for the efficient delivery of nicotine). Users Blythely inhale and exhale with no care at all for anyone behind them who gets a face full of the stuff. I almost prefer the real thing. 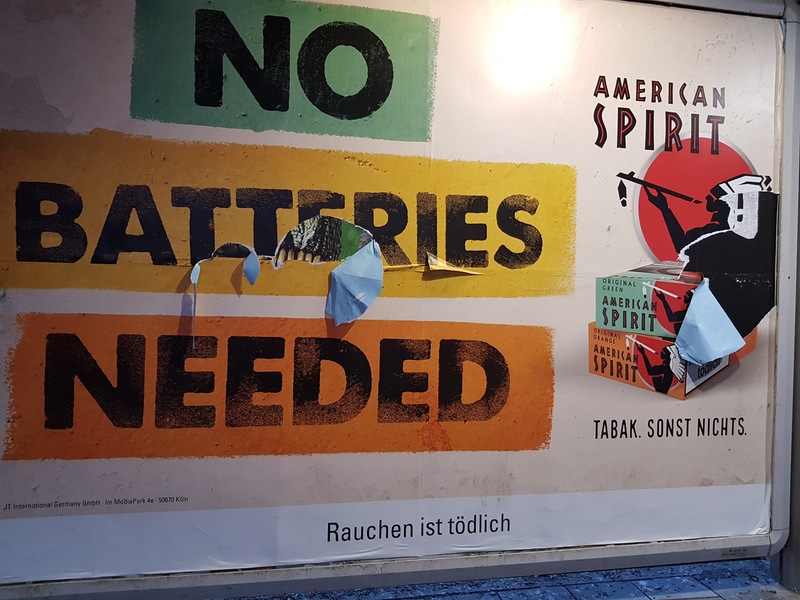 Anyway, not only are batteries not needed, but users get American Spirit. New to me. Looking forward to more genius straplines from this brand and its marketers. And here’s me thinking the Germans were in hock to Russia! 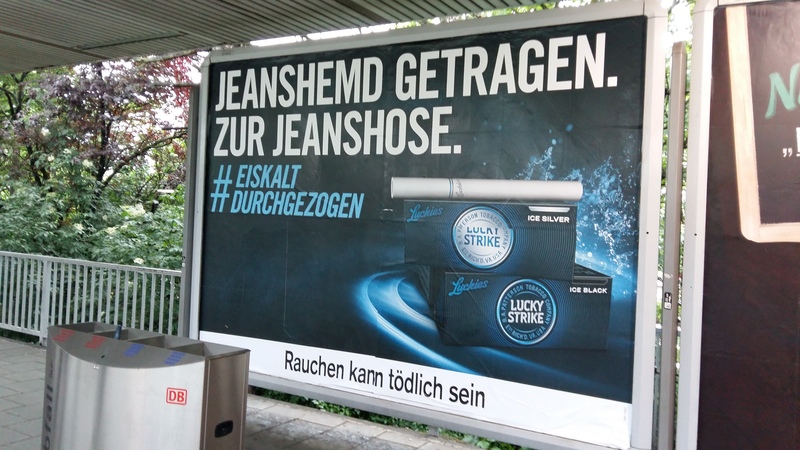 In recent weeks, the advertising territory has been completely owned by Gauloises. 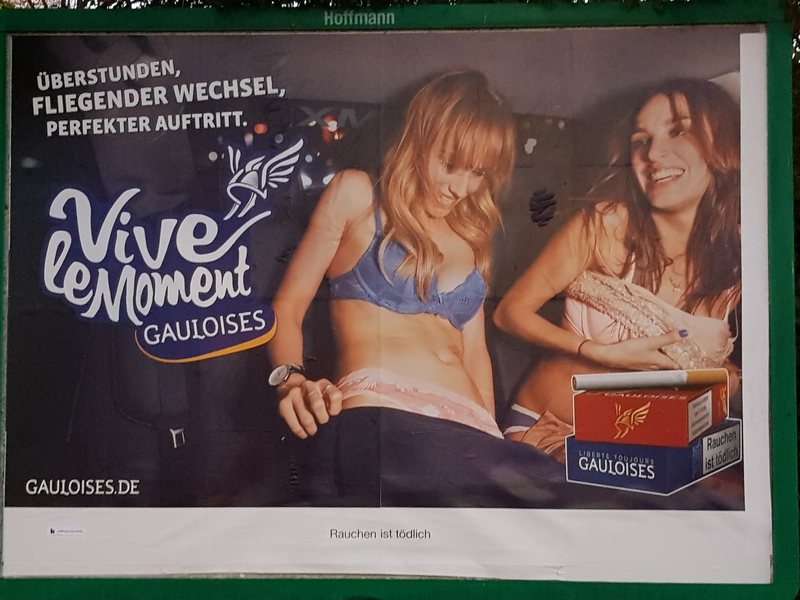 Indeed, Gauloises’ current campaign draws on the company’s favourite advertising theme, semi-naked women (left). I think the scenario is something like this – two women out for the night but have not had time to get ready because they work hard. So they bring their stuff with them and get changed in the taxi or some other vehicle. Whatever, they turn out brilliant. 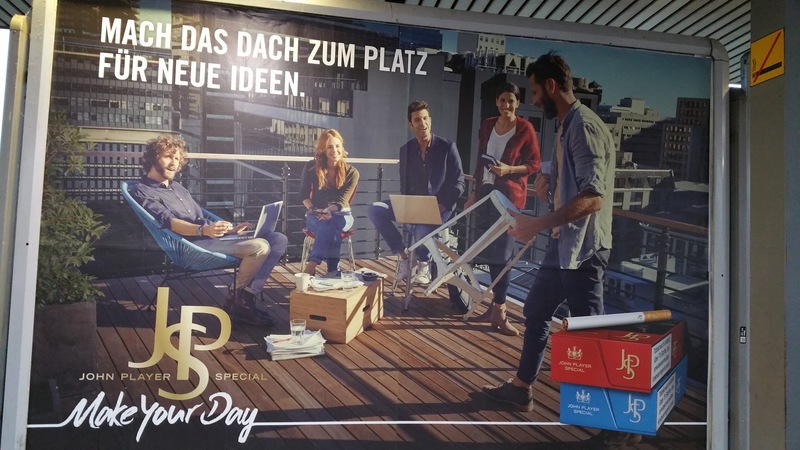 However, JPS is back with a bunch of ultra-annoying 20-somethings (2/3 bearded men) sat on the roof – because they are so antisocial that they are not allowed inside – thinking up cool business ideas (presumably). A couple of laptops to symbolise work/creativity. One of the bearded men can do laptops and smoke simultaneously. Both the women are smoking but they don’t have laptops (men’s work?). The two other blokes are sockless, one of whom seems to be able to do amazing things with stools. I say no more. Actually, I love the positioning of the poster next to a no-smoking sign! Not a huge amount to report on the cigarette company campaigns. No attractive young people having their lives ruined. N ot consciously, at least. That said, one cannot get over the sheer cleverness of the campaign managers with their slogans. 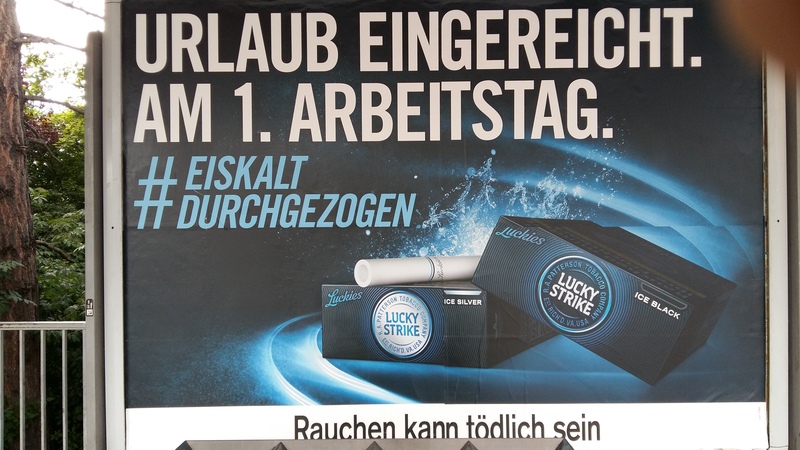 Take Lucky Strike, for example. Urlaub Eingereicht – holiday secured, if my translation works. Cause for celebration and anticipation? Hold on. Am 1. Arbeitstag. Not so good. A working holiday, maybe? At least we have Luck Strike. The hashtags seem to refer to the taste of the cigarette – icecold and, for want of a better word, persistent? Then there is Jeanshemd Getragen. Zur Jeanshose (right). I think for this one, it is too subtle for me. Literally Demin shirt worn. To Jeans trousers. Double denim or long shirt not needing trousers? Whatever it means, the product is deadly, icecold or not. 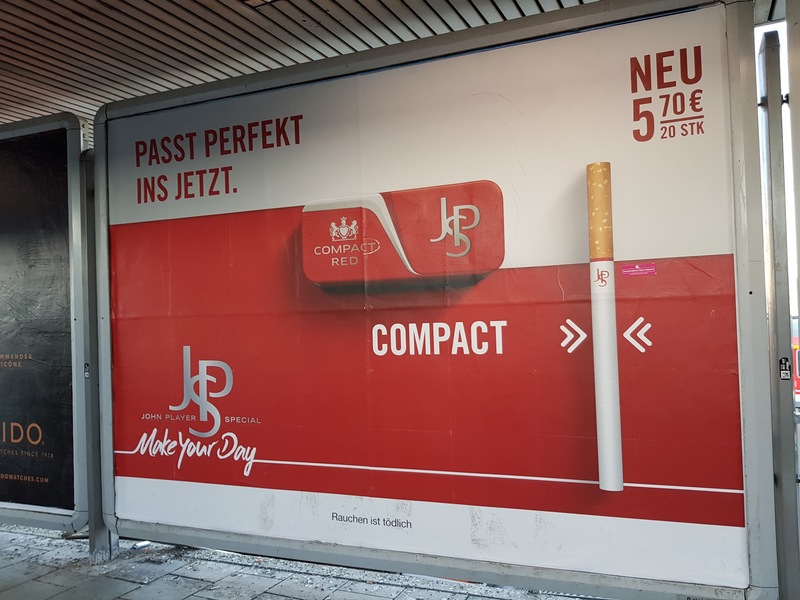 Finally, JPS are sticking with the big packs. 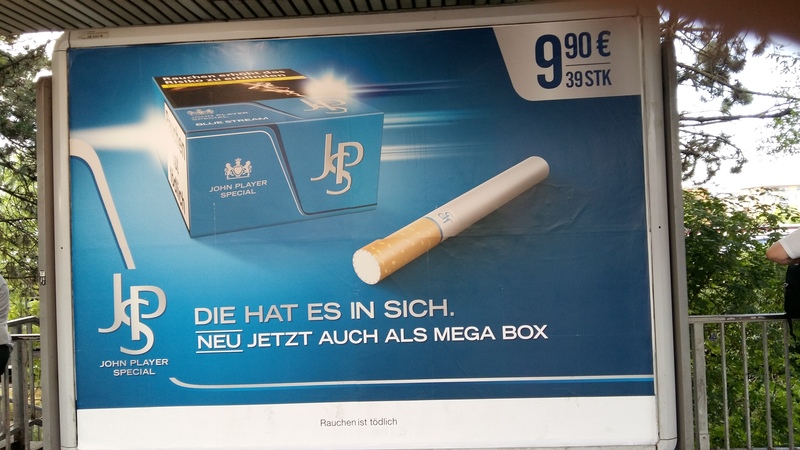 10 Euros gets you 39 cigarettes in a megadeath box. Sorry, megabox.